My daughter and son in law bought a new house, and asked me to make them more home decor. 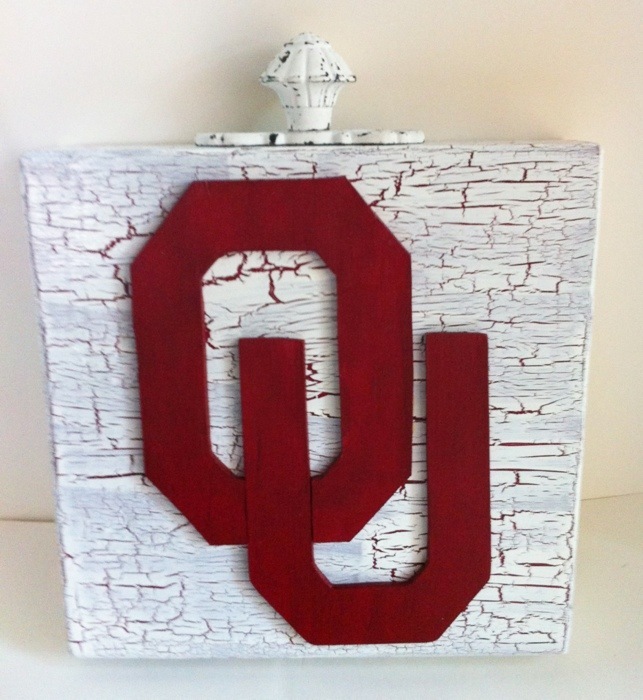 So since they are both big University of Oklahoma fans I came up with this to add to their game room. 1) First sand your wood. 2) Paint front, back, and sides with your dark red acrylic paint, letting each dry before flipping and painting other sides. 3) Once thoroughly dry put a generous amount of crackle paint on one side and let dry thoroughly. 4) Using your white acrylic paint, add a coat over the crackle painted surface. As the white paint dries it will start to crackle. 5) Once dry flip over and repeat steps 3-4 until all sides are painted. 6) Draw your letters on the thin balsa wood, use a utility knife to cut them out. Cut out a slot where one side of the letter U will fit into the letter O. 7) Sand letter edges then paint the top and sides with your dark red paint. 8) Centering, glue your letters onto your crackled wood block. 9) Once dry stand up and glue your vintage drawer pull, center top. This is an easy project to make for a unique gift that can be cherished for years to come. You could change the colors, and letters to represent any team you like, etc. Check back later to see the mixed media wall art that I made, and had a really hard time letting go. I will be making another. For Me!